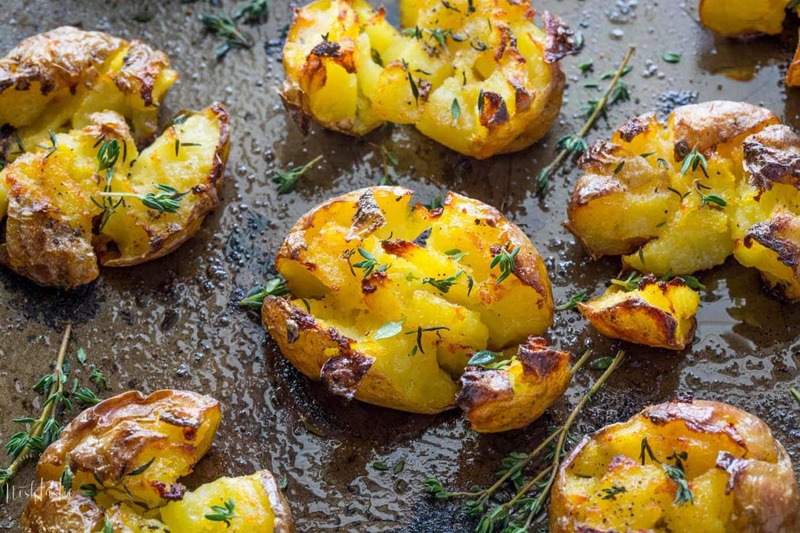 Smashed Potatoes baked with garlic, olive oil and herbs, fluffy in the middle and truly crispy on the top!! You guys, these are the PERFECT potato side dish, you won’t need anything else, I promise. Whether it’s steak or chicken on the grill, or burgers in a bun, my crispy garlic smashed potatoes will go down a treat and everyone will love them! We served them tonight with my Grilled Lamb Chops recipe and they went down a treat. Smashed potatoes are definitely not the same as mashed potatoes! Mashed potatoes are typically peeled and all the potatoes are mashed together until they are relatively smooth, often with the addition of butter and sometimes milk. Smashed garlic and herb potatoes are a little different as you can see from the photos. 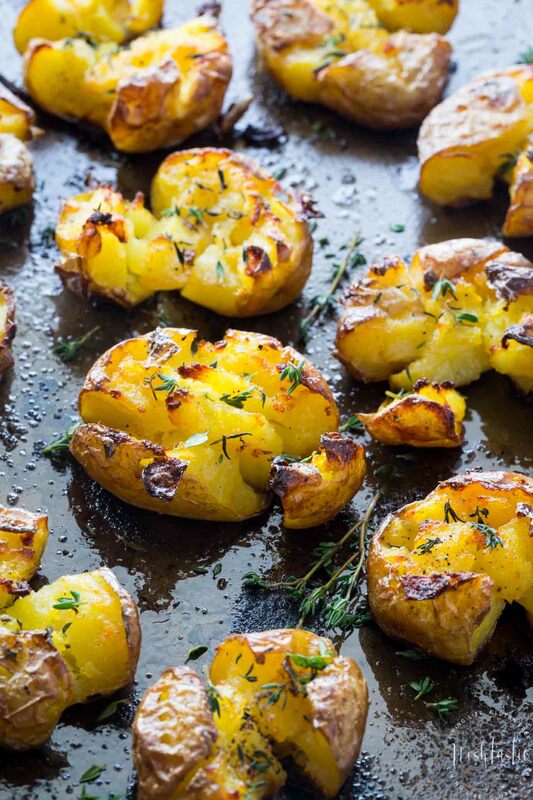 The potatoes are not peeled, are parboiled, and then cooked again in the oven with herbs, garlic, and a little oil (or butter if you prefer) until super crispy and totally yummy! What potato varieties are best for ‘smashing’? I’ve tried them with several varieties, Yukon Gold, Red Potatoes, and Russet Potatoes, and they all worked well. Generally speaking the fluffier varieties of potato rather than the more waxy potatoes work the best, but I think you could try it with whatever you have in your fridge if you don’t have floury potatoes on hand. How to make truly crispy smashed potatoes! There are several steps to ensure you cook truly crispy potatoes . Step 1: Preheat the oven, you want it hot and at temperature as soon as the potatoes are ready to go in the oven. Step 2: Parboil the potatoes, and make sure you DO NOT overcook them, we want them just cooked, not really soft and mushy. Step 3: While the potatoes are cooking combine the oil, chopped garlic and herbs so you are ready to go when they potatoes are cooked. Step 4: Drain the cooked potatoes, place them on a baking sheet and with a potato masher or a fork ‘smash’ the top of them and use a fork to break up the tops. 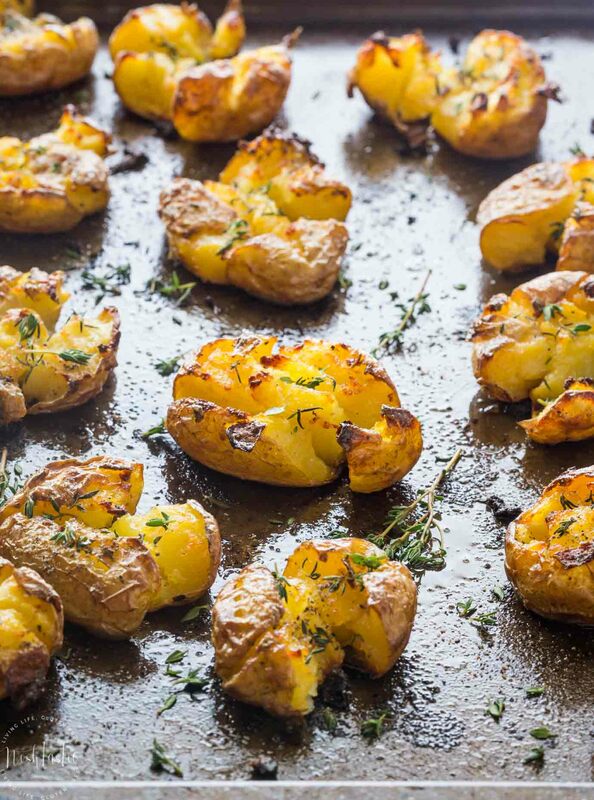 That’s the simplest way to get truly crispy garlic smashed potatoes that everyone will love. Do remember to serve them hot as they may not stay crispy for long once they start to cool down. PIN THIS TO YOUR SIDES BOARD! 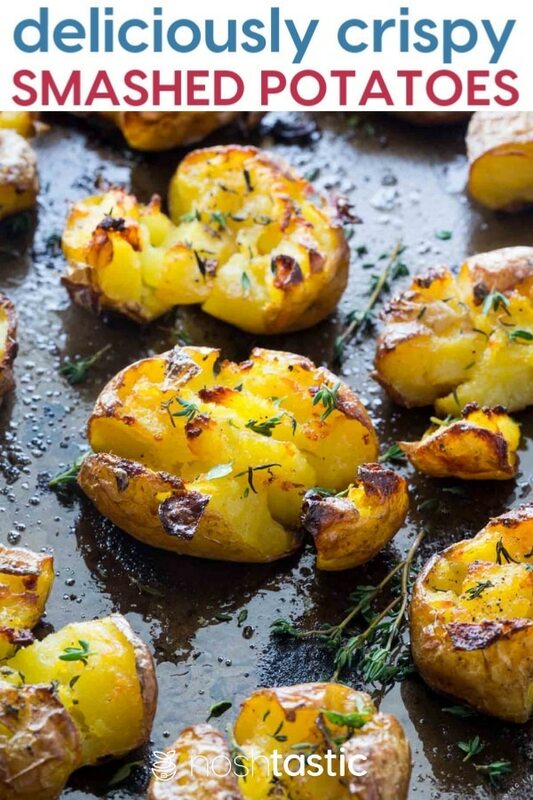 Smashed Potatoes baked with garlic, olive oil and herbs, fluffy in the middle and truly crispy on the outside!! Don't miss my recipe video, it shows you exactly how to make them! You'll find the video below the directions. Bring a large pot of water to the boil, then add the potatoes to it and cook until just cooked but not super soft (they will continue to cook in the oven) it will take about 15-25 minutes depending on the size of the potatoes. While the potatoes are cooking mix the oil and garlic together. Once the potatoes are cooked, drain them and then place the potatoes on a baking sheet. Using a potato masher or a fork 'smash' the top of the potatoes. I like to rough them up a little with a fork and remove a little of the skin on top, this ensures more crispy bits when they are cooked. 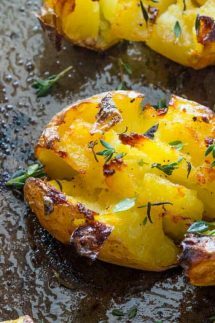 Evenly drizzle the olive oil (or use a silicone brush) on the top of the potatoes, then season with salt, pepper, and sprinkle on the fresh thyme leaves, then immediately place the baking sheet into the hot oven. Bake for about 20-35 minutes, or until the top of the potatoes are good and crispy! Serve immediately, the crispiness will not be as good once the potatoes start to cool, or if they have to be reheated later on. Best Ever Instant Pot Chili! Potatoes may be gluten free, but they are NOT part of the Paleo or Whole 30 diets. Actually they have been part of the Whole30 diet for the last three years. Paleo experts such as Robb Wolf and Mark Sissons have weighed in on the subject and recognise that potatoes are a healthy, nutritious, whole food. I know some others don’t eat potatoes as part of their Paleo diet, but there are plenty that do. I cannot rate the recipe because I do not have all the ingredients listed to make it exactly as posted. That being said, I LOVE this technique for making potatoes now. I’m so glad you shared! I used what I had and the cooking style worked great. So easy! We hadn’t any small potatoes. I quartered baking potatoes before boiling. We had olive oil, a bunch of fresh chives, and seasoned salt-so that was the mix on top after having boiled the potatoes. Because mine were cut they didn’t turn out as pretty as yours, but oh my goodness-SO GOOD! I loved the combination of crunch outside, soft inside. My meat and potatoes husband who seldom compliments my potato recipes told me that he hopes I’ll make this one often! We live in bush Alaska and don’t get to the stores that often, but as soon as I can I’ll get the ingredients to try your recipe exactly. This one definitely goes in the rotation! Hi Amanda, thank you for your kind comment! I’m glad they worked out for you with other types of potatoes and that your husband maked them, they are one of our favorites too. Excellent, simpler recipe. I think this is one fo those no fail delicous recipes. Thank you for posting this. I was delighted that mine came out as beautiful as yours. I’m glad they worked for you and sometimes the simplest recipes are the best! This is a straighforward, easy recipe that is great with roast chicken. I use baby potatoes from trader joe’s (more like fingerlings). They are great that night but not great as leftovers. yes, they lose their crispiness and are not great reheated, but we don’t usually have leftovers, lol!! I’m just wondering if you can parboil ahead of time and then smash and bake later, or if it needs to go right from pot to oven hot. I think it’s better going straight in the oven hot. But, you probably could give it a go if you boil them ahead of time, I would try and have them at least at room temp before putting in the oven if you have time rather than straight from the fridge.